(Bloomberg) – Not having a currency of its own hasn’t stopped Zimbabwe from sliding into a currency crisis. A scarcity of foreign exchange has led to long queues for fuel, bread and medicine and sent prices surging across the southern African country. Police clashed with protesters in the capital, Harare, on Monday as the main trade-union group started a strike after the government more than doubled gasoline prices to $3.31 a litre ($12.58 a gallon) over the weekend, the highest in the world, according to GlobalPetrolPrices.com. The roots of the pain lie in Zimbabwe’s decision to scrap its own currency, the Zimbabwe dollar, a decade ago, and to adopt a basket of foreign units of which the greenback is the most widely used. The central bank then started printing quasi-greenbacks to fund rampant government spending. The result is a convoluted system of exchange rates, with consumers charged different prices depending on whether they pay in real dollars, electronic money or so-called bond notes – even though the government insists all three have the same value. It undermined that argument by saying that foreigners could still pay the old price for fuel of $1.32 a litre if they used cash dollars. Finance Minister Mthuli Ncube said on Jan. 12 he’d introduce a new currency within a year. But he gave few details, beyond that the central bank was building reserves, which currently cover barely two weeks of imports. He’s also trying to restructure billions of dollars of defaulted multilateral debts so that Zimbabwe can obtain new international loans. As violent protests left 24 people injured and five possibly dead, Mnangagwa traveled to Russia and some of its neighbours before attending the World Economic Forum in Davos, Switzerland later this month. Meanwhile, many Zimbabwean manufacturers are closing down. The chief executive officer of Surface Wilmar, the biggest producer of cooking oil, said in an interview on Friday he had no choice but to shut the company because it couldn’t find the $6m it needed each month to pay suppliers. “Manufacturers are suffocating and unless something happens urgently, we could see the country grind to a halt,” Sifelani Jabangwe, head of the Confederation of Zimbabwe Industries, told reporters on Jan. 10. The nation’s biggest brewer, Delta Corp Ltd., which is 40 percent owned by Anheuser-Busch InBev SA/NV, struck a deal with the government this month to get more foreign-exchange from the central bank for imports. In return, it pulled plans to reject payments in bond notes and electronic dollars, known as Real Time Gross Settlement, or RTGS. Still, plenty of firms are offering discounts, sometimes of as much as 70%, if customers use real greenbacks. The stress has also spread to financial markets, with locals piling into equities to hedge against price increases. While official statistics say inflation is running at 31%, Steve H. Hanke, a professor of applied economics and expert on hyperinflation at Johns Hopkins University in Baltimore, reckons it’s much higher: 186%. Zimbabwe’s main stock index has climbed 65% since last March, easily the most globally. Foreign investors – who struggle to get their money out the country due to capital controls – have written down their holdings to more realistic levels. They measure how out of whack prices are by taking the difference between the London and Harare shares of Old Mutual Ltd., Africa’s largest insurer. The Harare stock is now 4.9 times the price of that in London, when converted to dollars, double the gap of six months ago. 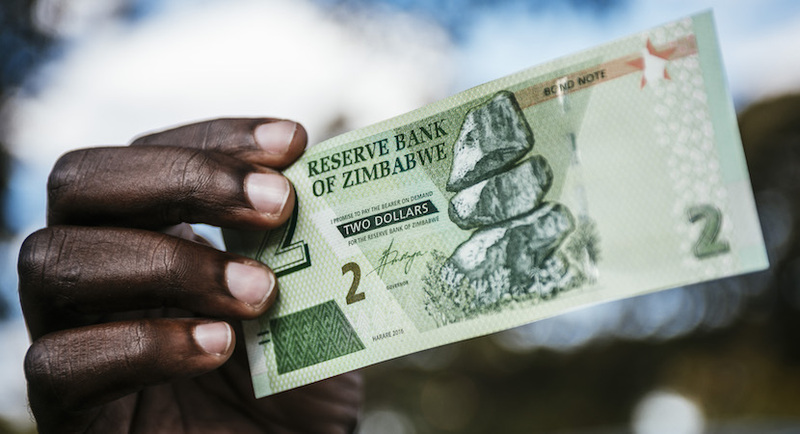 Hanke of Johns Hopkins says Zimbabwe should stick with the dollar because it won’t be able to protect a new currency, but scrap bonds notes and RTGS. The government could do that by accepting payments, including taxes, in those two at the same rate as the dollar. That would quickly bring down the discount for cash dollars to around 5-10%, he said. But Global Evolution’s Bailey-Smith disagrees. He argues the government should rein in spending and work quickly toward creating a new currency. It could could create confidence in the unit by using additional reserves and hiking interest rates – something it can’t do while it uses the dollar, he said.